Vintage aesthetics - are provided by this handcrafted Laguiole pocket knife in the typical and unmistakeable Laguiole design. - A precious knife from the French cutlery manufacturer Claude Dozorme at Thiers. Forged from one piece of top quality steel and shiny polished, for highest comfort. Equipped with a corkscrew and selected handle pieces with exceptional surface feel and visual appearance. - Purfled with the bee as the typical Laguiole design element. - A pleasure for all senses. 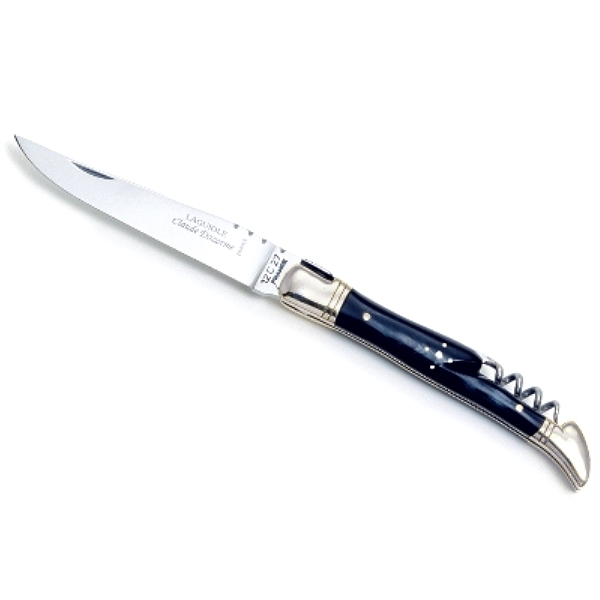 Laguiole pocket knife with Corkscrew, dark Horn/stainless steel handle, polished, Dimensions: haft l 12 cm, blade: l 10 cm.